NORWALK, CT – This year, Creative Connections is pleased to honor Rhonda Kiest, President and CEO of Stepping Stones Museum for Children, and the museum itself, as the 2018 Global Partner Honoree. The Global Partner award recognizes the outstanding contributions of an individual or organization that inspires global awareness among our youth. 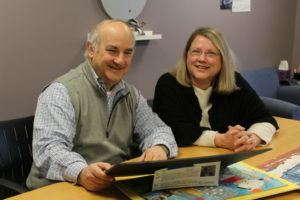 For more than two decades, Creative Connections has partnered with Stepping Stones Museum for Children on art displays, ArtLink programming, Professional Development, the International Young Performers Tour, and much more. Ms. Kiest and Stepping Stones will receive this honor at the Creative Connections 2018 Gala on April 21, 2018 at Stepping Stones in Norwalk, Connecticut. More information is available about the 2018 Gala at CreativeConnections.org/2018-gala. Creative Connections, an international nonprofit, connects students in the USA with their international peers through the exchange of art and ideas. Their mission is to help students become global citizens who are prepared to learn, live, work and thrive in the 21st Century. For more information on Creative Connections, visit www.creativeconnections.org, or follow along on Facebook, Twitter, and Instagram.